Skinny Budget: My Organized Closet: How I got it! My Organized Closet: How I got it! I really believe that having your closet organized not only saves you loads of time throughout the year but also it potentially saves you hundreds on your budget by minimizing spending on items you already have/ don't need/ will never wear :) These are tips on how I organize my own closet. - We all have different reasons why things are in our closet that we know we will never wear, but if you want a more organized closet than most of this stuff will probably be going. If you haven't worn an item within the last 6 months (12 at absolute maximum) then you need to decide whether you want to sell it for extra $$ (online is a great and generally free way) or give it to charity, that's up to you. Step 2: Find YOUR Style! I don't know about you but I have fallen into the trap of loving the style of a celebrity, then trying to dress like her and it turning out horrible because I have a completely different body shape. This has resulted in clothes being purchased that I never wear, but never get rid of (see Step 1). This step again frees up more money for you to invest in clothes you would love to wear but never thought you could afford!! Remember step 1: Vaccum Seal bags. This step also allows you to maximise the space you have, I'm sure we'd all like a bigger closet (and budget to match) but maximising what space we do have is much more realisitc. I have another post about Wardrobe Organization that offers tools and products to help maximise your space. Click HERE for that post. Step 4 really is about making the most of what little or big space you have been granted. 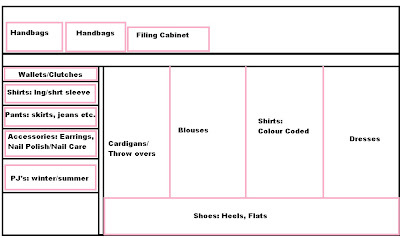 It's a very smart idea to come up with a layout for your newly organised wardrobe. 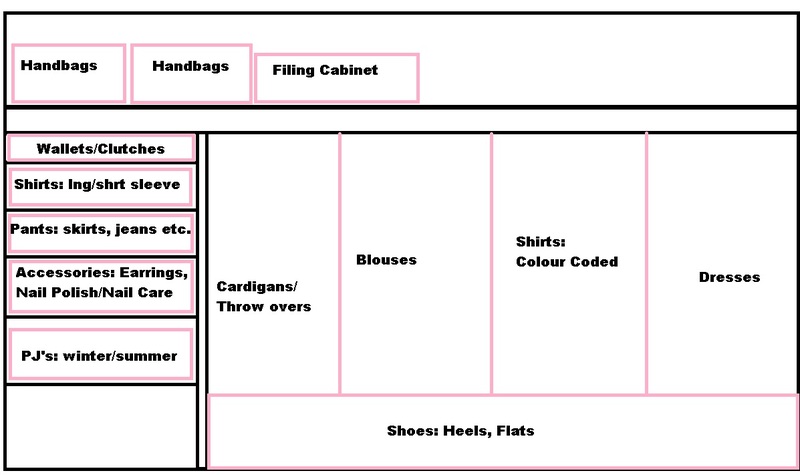 Below is the image I drew up on Microsoft Paint (you can just draw it with good ol' Pen and Paper) to illustrate my NEW closet organisation. This step really does carrying on from Step 3 of Maximising Space, when you draw a layout it allows you to clearly see the space that is in YOUR closet and the placements available for YOUR clothes.